Shares in Switzerland’s biggest bank UBS rallied on Thursday as Marcel Rohner announced his resignation, just weeks after announcing losses of nearly $17 billion — the largest ever by a Swiss group. 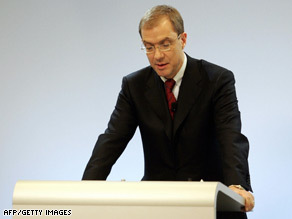 Rohner is replaced by Oswald Gruebel, who served as CEO of rival Credit Suisse from 2003 until 2007. “With his previous employer Credit Suisse, Mr. Gruebel was the architect of a successful turnaround and restored confidence in the company in turbulent times,” UBS said in a statement. UBS shares rose more than 10 percent by 1020 GMT on Thursday as investors hailed news Rohner was leaving the bank. “UBS shares are likely to rise today, but this will be more because Rohner is going rather than because it’s Gruebel who is replacing him. The news that Gruebel is moving to UBS is bad for Credit Suisse as he is likely to take some good people with him,” one Zurich-based trader told Reuters.com. After the huge loss was posted earlier this month, UBS announced there would be 1,600 new job cuts in its investment bank unit, which suffered the largest exposure to the collapse of the U.S. sub-prime mortgage sector. It said it would reduce headcount to 15,000 from approximately 17,000, excluding roughly 500 employees at units the bank has previously announced its intention to exit.